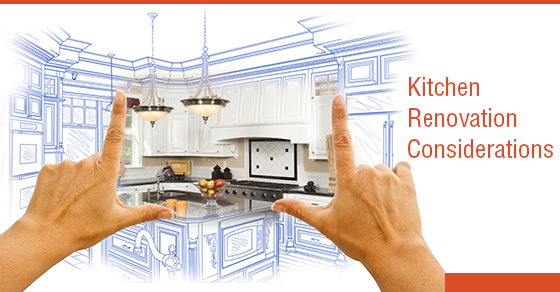 Kitchen remodeling offers homeowners the best return on investment over any other home upgrade work. With an increased resale value of their home and endless renovation options, it’s no wonder that so many property owners are now reviewing their home kitchen options. There are many things to consider when remodeling your kitchen from budget to style. In this blog, we’ll review the factors all homeowners should consider before starting their renovations! What role does your kitchen play within the home? Do you use the kitchen as a space in which to host dinners with family and friends? Or do you only use it to prepare tomorrow’s lunch? These questions will give you important insight as to what aspects you’ll benefit from the most. Some people may want ample room for multiple people to mingle, while others benefit from more counter space to concentrate on meal preparation. Know what you’ll be using the kitchen for so you know what you’ll need to include! Take a look at your current layout – what is it missing, and what are the current challenges that prevent effective utilization? You may need your outlets closer to your counter space to plug in kitchen electronics, or you may require extra light closer to working areas of the room. These are important considerations before beginning the kitchen renovation process and will help when it comes time to design the space. One of the leading challenges affecting homeowners in their kitchen is electrical work. Blown fuses and limited outlets can be a frustrating element of living in a home with an older kitchen space. There might also be broken tiling or sagging floors that will require replacement during the renovation process. Kitchen renovations aren’t just for aesthetics! These infrastructural issues should be addressed during your kitchen facelift. An effective plan for a kitchen renovation process will take each of the previously outlined elements into consideration. Then you can begin analyzing your budget and decide whether your ideal kitchen is practical given your financial restraints. In creating your budget, it’s important to settle on features, building materials and finishes as early as possible to ensure you have the funds to complete the job. This will help prevent any costly changes at a later date, and ensure that each element of the process can be completed seamlessly. Kitchen renovations require a commitment to proactive planning and comprehensive research. Review the factors highlighted within this article and speak to your local kitchen renovation specialist about the range of design options available.